The ship began rocking and rolling around 3:30 am and we knew that winds had picked up on our way to Georgetown, Grand Cayman this morning. By 7:30 am Captain Klaus began making announcements that the seas were rough but that he hoped the crew would be able to tender, the term that refers to staying out in the ocean because the sea is too shallow or the port too small and having smaller boats ferry 75 or so passengers at a time to the port. I explained to Sophie that this is the fourth definition of the word “tender” that I know and may come up on the SATs. Five of the other ships in the region were unable to tender or arrive at port so Captain Klaus was quite proud of his crew. Look carefully at the scale of the photo above: the tenders are the tiny-looking 2-level boats to the left of the ship. For scale, the ship is 13 stories. We were in Grand Cayman during the day so there were no day classes but Pam Holland gave a lecture and Carol Ann Waugh is teaching a night class as I write. Our first stop today was a turtle sanctuary. 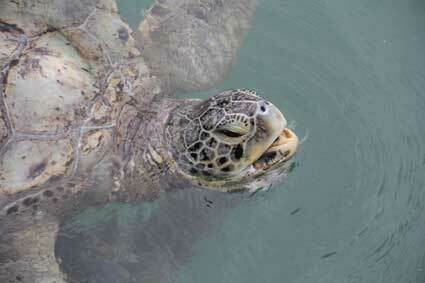 The turtles were divided up by species and age in large, shallow pools. The largest pool, the mating pool, adjoined their artificial beach that allows them to bury their eggs. We learned that the female typically lays over 100 eggs at a time (sounds exhausting!) and the newly hatched babies have to climb through 35”+ of sand (also exhausting – especially for a newborn, right?) to find their way to water. 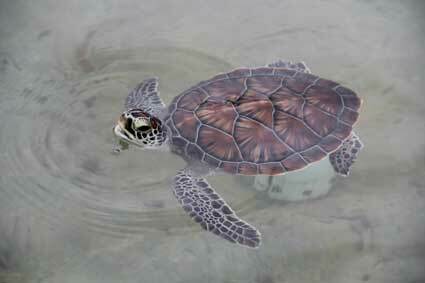 Bill and I found the coloring and patterns on the shells, fins and heads of the turtles mesmerizing. As Bill noted, it’s easy to see why people have wanted to make beautiful things from their shells. We were allowed to picked up the babies but the adults were well over 3 feet long. On the way to our next stop Bill and I noted that there was an ice cream shop selling turtle sundaes, a family favorite. I commented that I could think of no better place to have a turtle sundae than there, however we both joked that the better day to do that would have been Sunday! Across the street was the Dolphin Adventure center. This is one of those places where you can swim with dolphins and touch stingrays. It’s also one of those places that likes to shake you down for photos ($40 a piece) so they don’t allow you to take your own, so I have none. Although the place was an organizational nightmare, the experience of riding belly to belly with a dolphin and having a dolphin propel each of us on a boogie board was memorable. We even got to “dance” with her. 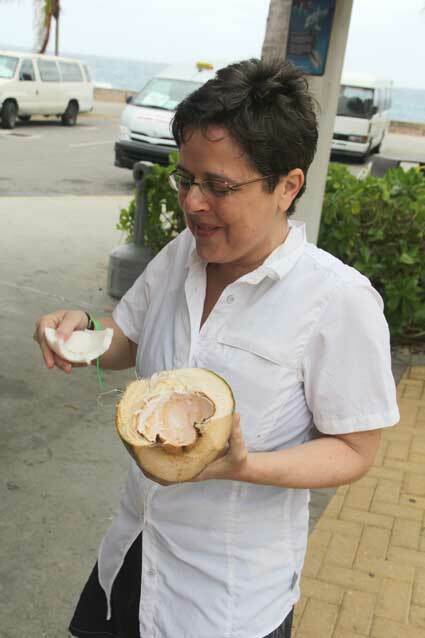 While waiting for our tender to return us to the ship we got a fresh coconut with brown sugar from a vendor. Even Sophie, who doesn’t like coconut managed to choke down 1/3 of it. Tomorrow: Our last stop of Cozumel. Our family is signed up for “The Amazing Race Cozumel” which has extremely high reviews and pits various families in a race involving clues found throughout the island over a 4-hr period. Sophie, as a long-time fan of this, the only show we watch as a family, is determined to win. Any clues involving the Periodic Table or calculus will have to be solved by Bill. I know my limitations. Stay tuned. Wow, such a wonderful family vacation even if Mama had to work a few days. Zip lines, turtles, dolphins and a Great Race, can’t wait to hear the details! Your cruise comments are actually inviting enough to make us want to try a cruise….one of the last “travel” opportunities we have so far ignored……I’m particularly jealous of the ziplining and dolphin swim……happy sailing! Thanks for taking time to write about your vacation adventure. 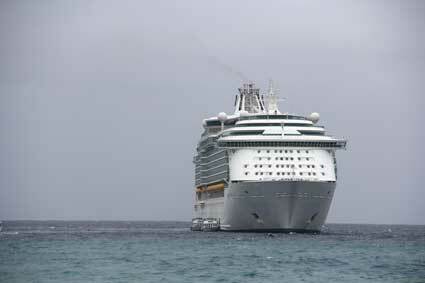 I think you have probably drummed up quite a bit of interest in cruise vacations. It sure sounds like fun. Enjoy your last stop. I see a turtle quilt in your future!